Educators who work in low-income schools understand technology could help them understand student needs better and create more engaging learning experiences. But tight budgets make some of the more ambitious schemes, like one-to-one computer access a distant dream. Yet it’s precisely the schools with under-served student populations that stand to gain the most from technology. Class sizes are often large and teachers are looking for ways to keep the class engaged and focused when they work one-on-one with a struggling student. Smart use of technology could save them time with grading and tracking student progress, for example. Still some high-needs schools are only just beginning to push for school technology. Despite this, however, Encompass managed to roll out a blended learning program for first through fifth grades last year and has added Vinci tablets to its kindergarten class this year. Nguyen has worked in cash-strapped public school districts for a long time and knows how to seek out partnerships with private companies that can offer free products, how to invest in infrastructure when the district has money and how to be strategic about integrating technology and supporting teachers. In the frenzy and confusion of implementing new strategies it’s easy to lose sight of a school’s mission. Technology shouldn’t force a school away from its guiding principles; it should be implemented thoughtfully to complement those goals, she says. For example, Encompass teaches to the whole child and has a heavy focus on engaging parents and community, so Nguyen looked for tech products that had strong family communication tools in several languages. Any educator will tell you how important parents are to student success. But in high poverty schools where many parents don’t speak English, the barriers to active parental engagement are higher. Encompass makes a big effort to involve families in their school community, but not necessarily measured by parent volunteers. They think about how parents can engage with every aspect of the curriculum including new technologies. When Vinci donated tablets to its kindergarten students, Encompass had the company train parents on how to use them. The school uses Achieve3000 in Language Arts because it offers letters home in Spanish, access to student dashboards by mobile device and even an audio function so parents can listen to the articles their students read. “Our family members who want to engage and read and practice and develop their literacy could engage and do it side by side with their child,” Nguyen said. Although tablets and laptops are trendy right now, Nguyen decided to get desktop computers for her classrooms because they are durable. She also already had some that were going unused that she could leverage to extend her budget. Her classrooms have eight to ten computers in them, but they don’t take up too much space and there is a computer lab as well. Nguyen took advantage of one-time district money available and doesn’t want to have to update or buy new devices too soon. 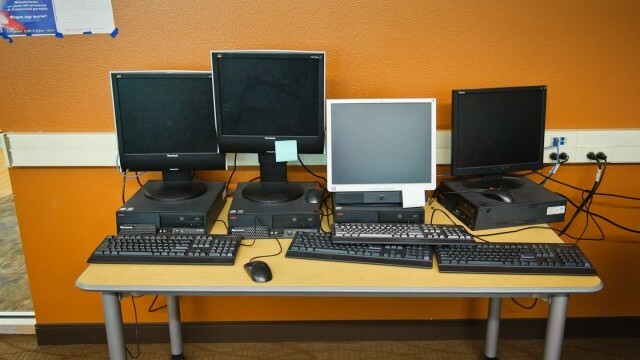 “For a long time our computers were available, but they weren’t really used, except for word processing,” Nguyen said. She knows that’s because teachers didn’t feel comfortable integrating the technology into their lessons. They need professional development and the ability to offer input into what software and models the school uses. “It’s not about the online content, it’s about the structures and putting it in a meaningful way for teachers to use it,” Nguyen said. “It’s not about releasing the kids to do the work,” Nguyen said. “You actually have to teach them how to be successful.” Computers aren’t teachers, but they can offer a space for students to practice skills they’ve learned or explore new ones while a teacher is working with smaller group of students. The software can help grade assignments, track progress and give insight into where the teacher should focus time and effort. For example, Encompass piloted a rotational model with its fourth and fifth grade students last year. Rather than staying with one teacher for all the subjects as most elementary schools do, the kids rotated between English, math and the computer lab. Since teachers often have a subject area where they shine, each student got the best teacher for each subject and the computer lab helped keep classes small. “In private schools it’s about excellence, it’s not about achievement,” said Nguyen. She highlighted the subtle difference in expectation for kids at high poverty schools as a way the school system undermines their ability to succeed. “When you strive for excellence and quality and opportunity for kids in an equitable way, they respond, but the content has to be of high quality.” Nguyen has not adopted any technology tools that she didn’t find to be pedagogically sound, based on research and well suited to her students. Nguyen has had good luck working with small start-up businesses, in part because she’s entered those relationships with her eyes open. “They were hungry; they were willing to be nimble,” Nguyen said. She found that useful, but when a start-up company changed its business model, deciding not to work directly with schools anymore she wasn’t surprised or taken off guard. She appreciated what they gave her, but was able to pivot when it didn’t work out as she expected. “I’m used to having to do things despite what infrastructure already exists in our system,” Nguyen said, a mindset that serves her well as she moves with the ups and downs of implementing a blended learning curriculum. Nguyen has been very clear with companies seeking to partner with her school that Encompass has a mission and plans to stick to it. When she interviews a potential tech partner she is looking for how responsive the company will be to her school’s needs and whether they can produce data in useable ways. She’s also careful to continue building relationships after its already underway, checking in and continually realigning the two visions for the partnership.